Frederic Tudor was the “Ice King” of early nineteenth century America. It was Tudor who realized that ice, harvested from New England ponds and rivers could be shipped to the Caribbean. Shipping was cheap, because ships often went empty to pick up cargo; insulation could be made from sawdust, a waste product of the New England lumber industry. His first shipment was in 1806; after failure and adaptation, he was shipping ice throughout the Caribbean, and using leftover ice to bring back tropical fruit. In 1833, he began to ship ice to India, which would become his most lucrative market. 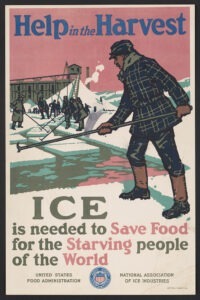 Tudor’s story is just one of those told by Jonathan Rees in his book Before the Refrigerator: How We Used to Get Ice. It’s the third book he’s written about what Rees calls “the modern cold chain.” That might not sound very exciting. But Rees is describing something very interesting indeed: how complex technological systems can develop without any central controlling force. There were no monopolies in refrigeration, no central government agencies. It just…happened. With a lot of work. How it did is the subject of our conversation.